Designed for competition at every level, the Men’s Hurricane Wetsuit Cat 3 utilizes some of the best features from our Cat 5 Hurricane to optimize speed and help you outperform the pack on race day. 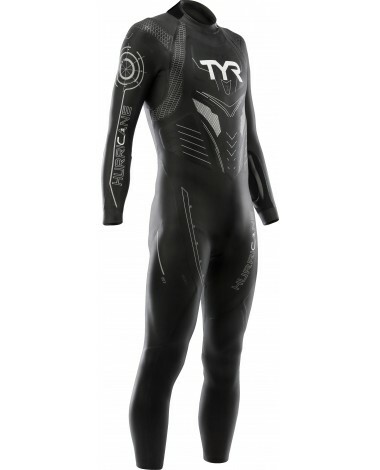 At TYR Sport we believe that having the best wetsuit begins with having the best fabrication. As a result, every Cat 3 Hurricane is constructed with 100% 38 Cell Yamamoto neoprene. In addition, the process of Super Composite Skin (SCS) Nano Coating is used alongside the fabrication to enhance comfort and freedom of movement. With both hydrophobic and hydrophilic properties, SCS repels water, ensures high heat retention for decreased body fatigue and boasts incredible durability to prevent abrasions and increase product life. Rather than a standard seam construction, each Cat 3 also utilizes speed wrap paneling to comfortably hug and hold you in. Each and every HCCTM6A wetsuit also includes quick release ankle cuffs, an innovative antimicrobial lining and state-of-the-art range of motion zones. I havent had a chance to actually swim in this yet because its February in Minnesota but I just wanted to comment on the sizing. 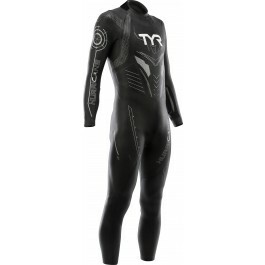 I had read numerous posts and forums around sizing issues with wetsuits and decided to purchase directly from TYR knowing that there would be less of a hassle with exchanges if necessary. I am 31 years old, 60inchќ and currently weighing in at 215 lbs. so I went with the XL according to the provided size chart. Again, I havent actually swam in it yet but Ive worn it around the house a few times and it fits GREAT. I thought some of the other bigger guys would appreciate the feedback. I used my CAT 1 almost every day last winter and spring, logging more than 200 miles. I got my CAT3 for Christmas and its a terrific upgrade. I LOVE it! The fit is perfect thanks to help from Customer Service. Every piece of equipment Ive gotten from TYR is first rate and lasts much longer than expected. Q: I am 6'3" and 180 lbs, but wear a 44R suit jacket as my shoulders are relatively broad from years of lifting weights. Would you suggest a L or XL for me. This is the first wetsuit I have purchased. What happens if I get it and feel that it is the wrong size? A: Thank you for your inquiry. According to your height and weight, you should be in a size Large. As this is just a guideline, this can be dependent on your body structure. You mentioned you are broad chested, it sounds like it may be tight through the chest. You may find an XL to be a better fit through your shoulders and chest. We have a 30 day replacement guarantee. Q: I am 5ft11in1/2 166 lbs not sure between the M or ML. What is your return policy if it does not fit ? Westsuits (by design) will provide a highly compressive fit. If you prefer less compression (similar to a surf style), you certainly can size up. We do have a 30 day return/exchange policy. Q: I am 5'10" and weigh 170. I am reasonably muscular in my chest and arms, much less in my legs. I swam this morning in a Large CAT 3, from my local Tri Store. I felt slightly restricted in my shoulders and somewhat restricted in being able to inhale to full lung capacity. Looking at moving to an XL seems a little crazy compared to the Size Chart. Is this normal, or do you think I should move up to the XL. PS - Today was my first time to swim with a wetsuit. A: Thank you for your inquiry. According to your height and weight, you should be in a size Large. As this is just a guideline, this can be dependent on your body structure. You mentioned you are broad chested, it sounds like it may be tight through the chest. Since it is your first time in a wetsuit, it may just take getting used to. Q: What size should I ware? I am 5'4" and 133 pounds. According to the size chart, my size should be XS. After reviewing all the reivews, some guys recommend one size up to buy this wetsuit. Please help me here.Thanks. A: Thank you for your inquiry. We would recommend a size Small. Q: wHAT KIND OF SPRAY OR OIL DO YOU RECOMMEND USING TO GET THE CAT 3 SUIT OFF WITH? IT IS A TIGHT RACE FIT I KNOW, AND A BIT TIGHT GOING ON, BUT WHAT ABOUT REMOVING THE SUIT IN TRANSITION? THANK YOU! We would not recommend using any solutions on your wetsuit other then body glide. Using other solutions can damage your wetsuit. There is a proper way to take off and on, for quick transition. Built for all levels of competition, The redesigned Men's Hurricane Cat 3 Wetsuit showcases a 100% Yamamoto 38 Cell Nano SCS Coated Neoprene exterior to provide sleek and flexible performance in the water. WTC (Ironman) / USAT legal.